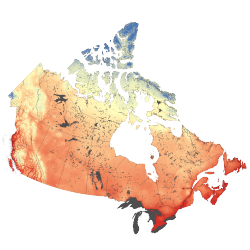 The Climate Atlas allows you to explore how climate change is likely to impact Canada’s vast and diverse forest ecosystems. Much hotter summers, milder winters, and changes in precipitation will likely lead to more frequent and intense forests fires, new invasive species, and an increase in pest outbreaks. Climate change may also make it possible for trees to thrive in previously inhospitable areas, like north of the current treeline or near the tops of mountains. Understanding the magnitude of these various changes and risks allows forest managers, emergency response coordinators, citizens, politicians, and planners to take meaningful action to mitigate and adapt. 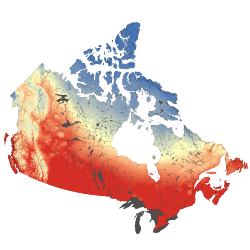 High, persistent temperatures increase the risk of drought, put more stress on trees, and magnify the risk of fire. Similarly, high temperatures can also lead to more thunderstorms, meaning an increase in lightning strikes that can start wildfires. Warming winters may have several impacts on our forests. Warmer temperatures may lead to less snow, which many trees species rely on as insulation for their roots. The populations of many tree pests are kept in check by very cold temperatures, leading many researchers to worry that warmer winters may increase the risk of damaging pest and disease outbreaks. Growing Degree Days (GDD) are correlated with tree and insect growth rates. Different base temperatures (5, 10 and 15 °C) are used to capture results for trees and insects that require different amounts of heat. A large increase in GDDs may mean a large increase in the number of forest insects, like beetles, caterpillars, and budworms. 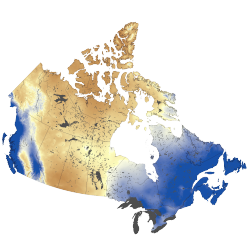 Precipitation patterns are critical to forestry for many reasons, including water availability, snow cover accumulation, and short- and long-term drought risk. 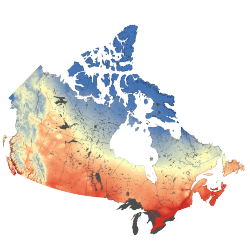 The Atlas provides precipitation data averaged across the seasons, so it is possible to explore how precipitation patterns might change over the course of the year.